Jungle King Video Slot Guide & Review - Casino Answers! 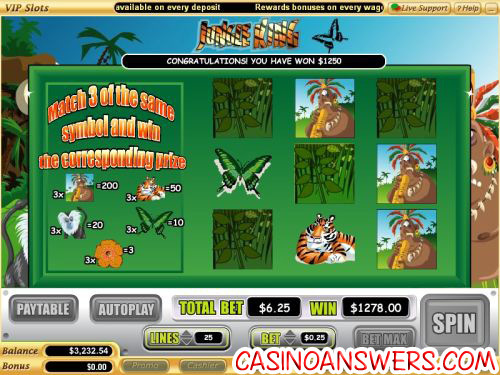 Jungle King is a 5-reel, 25-line video slot found at online casinos that use the Vegas Tech platform, featuring a wild substitute symbol, scatter wins and a bonus game. 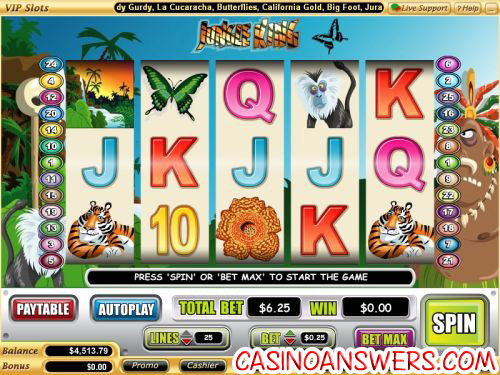 You can play the Jungle King video slot game at US-friendly casinos Millionaire Casino and Crazy Slots Casino. Bets on the Jungle King slot machine are $0.01, $0.05, $0.25, $0.50, $1, $5 and $10 per line. You can bet up to 25 paylines for a total bet of up to $250 per spin. Of course, you can also bet as little as a penny per spin if you really want to bet conservatively. To play all 25 paylines on Jungle King, hit the “Bet Max” button or hit “Spin” for other bets. The highest paying symbol on the Jungle King video slot is the Tiger symbol. It will pay up to 3750 coins if you hit five symbols on a selected payline. The Monkey symbol will also pay well – up to 1500 coins. The scatter symbol is the Jungle symbol. 2, 3, 4 or 5 Scattered Jungle symbols will pay 1X, 5X, 20X or 200X your total bet, which is another excellent payout. The Big Chief symbol is the wild substitute symbol on Jungle King. It will not pay out by itself, but it will substitute for all other symbols except for the Scattered Jungle symbol. The prize is doubled when the Big Chief symbol completes a winning combination. It only appears on reels 1 and 5. When it does, you will get a special flute sound effect and animation. Also when the Big Chief symbol appears on the first and fifth reels, you will trigger the Jungle King bonus game! You will get 1 to 3 rounds to match 3 symbols. There will 9 Jungle squares to choose from. The game will continue until three of one prize symbol is found. The prize table will be listed at the left. Bonus round wins are added to payline wins. As you can see by the screenshot below, you can win big by matching three Big Chief symbols on the Jungle King bonus game at Millionaire Casino! Hit “Autoplay” to open up the autoplay mode on the Jungle King slot machine. In spin settings, you can set the number of spins (5, 10, 25, 50, 100, 250 or 500) and the number of seconds between spins (0.25, 0.50, 1, 1.50 or 2). Stop settings include to stop once all spins are complete, stop when a jackpot is won, stop if a win exceeds or equals ($50, $100, $150, $200 or $250), stop on any win and stop if credits increase/decrease by ($50, $100, $150, $200 or $250). You can stop autoplay at any time by using the “Cancel Autoplay” button. Payouts are made according to the Paytable. Payline wins are multiplied by the bet per payline. Scatter wins are multiplied by the total bet and added to payline wins. Only the highest win on each selected payline is paid out. Coinciding wins on different paylines are added. All wins occur on selected lines except for scatters. All symbols pay left to right and/or right to left. The Big Chief wild symbol only appears on reels 1 and 5 and substitutes for all symbols except for the scatter symbol. The prize is doubled when one or more Big Chief symbols substitute in a winning combination. Jungle King’s main strength is its bonus game. Keep in mind, the bonus game will not trigger easily. Unless luck is on your side, you will have to play quite a few spins before you will get to play the Jungle King bonus game. However, once you do trigger it, you may be in for some big wins. To give Jungle King a try, please sign up and make your deposit today at Millionaire Casino! Are players from the USA welcome to play Jungle King for real money? Players from the United States of America are absolutely able to play Jungle King for real money at Millionaire Casino and Crazy Slots Casino. Can I play a free Flash game of Jungle King with no download required? Jungle King is one of the many games offered at Millionaire Flash Casino and Crazy Slots Flash Casino. You can play for free or for real money if you wish. If you have problems getting the Instant Play Flash casino to work, make sure you have the latest version of Adobe Flash Player installed on your computer. How do I get the Jungle King bonus round to start? To play the Jungle King bonus game, you must have the Big Chief symbol on the first and fifth reels at the same time. Where can I play the Jungle King Slot online?